The present portrait was painted in 1586 when the sitter was fourteen, almost certainly to celebrate his recently acquired title of Duke. In 1585, he was conferred with the Dukedom of Civitanova nelle Marche by Pope Sixtus V, and thus he became the first duke of those lands. Born in Rome in 1572, he was a scion of the Roman noble family; his parents were Giovangiorgio (1550 – 1585), 2nd Marquess of Civitanova, Montecosaro, Ardea, Genzano, Civita Lavinia, and Clelia Farnese (c. 1556 – 1613), the illegitimate and much-loved daughter of Cardinal Alessandro Farnese (1520 – 1589). After she was widowed in 1585, Giuliano’s mother acceded to her father’s request and married Marco Pio of Sassuolo on 2 August 1587. Clelia moved to Emilia, leaving her adolescent son in his grandfather’s care. 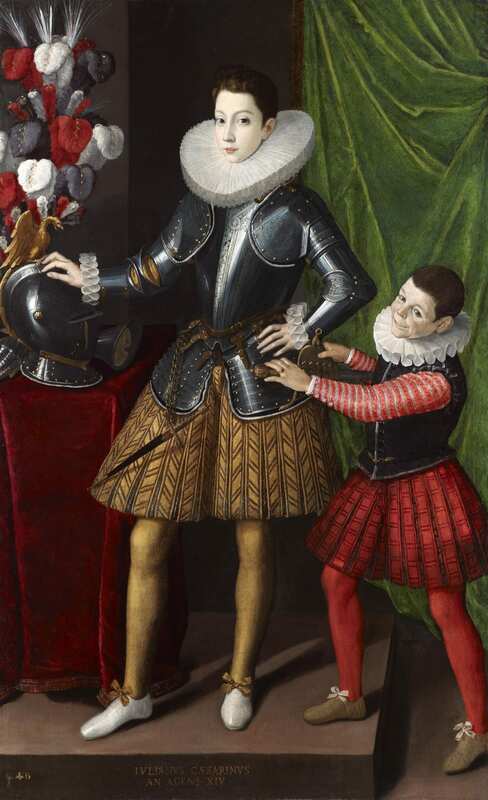 It is possible that it was Cardinal Alessandro Farnese – a refined man and great patron of the arts – who commissioned and paid for this celebratory portrait of his grandson and ward. In fact, Alessandro Farnese played an important role in establishing a position for Giuliano. and by descent until 2012. Archivio Sforza Cesarini, Rome, typewritten inventory, probably late 19th century, drawn up by Mario Malcangi, no. 98: ‘Ritratto di Giuliano Cesarini a 14 anni - olio su tela di cm 187 x 115.2’. In the decades straddling the 16th and 17th centuries, the Cremonese portrait school had several notable artists including Giovan Battista Trotti called Malosso, Bernardino Gatti called Sojaro and Gervasio Gatti - Bernardino’s nephew - who all worked on prestigious commissions in Cremona and for the Farnese court in Parma. Gervasio Gatti was already renowned as a portraitist in 1585; in his Cremona Fedelissima, Antonio Campi mentioned his ‘grace in portraying from life’, as the author of infinite portraits of ‘Lords, Princes and gentlemen.’ His work as court portraitist for the Farnese is confirmed by several period inventories and by the 1774 biography of the artist written by Giovanni Zaist. Stylistically, Gatti’s portraits are indebted to the influence of his uncle Bernardino who was strongly tied to the Correggesque movement dominant in nearby Parma, and which the young Gatti reinterpreted in cold, glazed colours and polished shapes. The lack of psychological characterization in this portrait – the stately pose, the attention to the fine details in the armour and clothing – make it possible to include this painting in the category of ‘StatePortraits’. It falls among the Hapsburg-Farnese court portraits that are modelled on Titian’s paintings for Charles V and for his son, Philip II (both in the Museo del Prado, Madrid) and the works of the Dutch painter Anthonis Mor, who is documented as having worked for the Farnese court. Mor’s influence on Gatti’s portraits is evident from his early copy (now in Berlin) of the Utrecht painter’s portrait of Margaret of Austria (Palazzo Comunale, Parma). In our portrait, the boy’s regal features are skilfully portrayed, conveying his newly exalted position in a suitable pose contrasting with the lively and colluding expression of his midget page, who is rendered with a natural spontaneity more common in northern, particularly Lombard painting. Gatti opens the curtain on a scene where the midget is caught in the act of taking his master’s sword, cheekily smiling at the viewer. Gatti gracefully depicts the soft, colourful feathers on the left, which are part of a heraldic crest partially concealed by the helmet on the table. The shining armour - in the style of Milanese armourer Pompeo della Cesa, and therefore made between Milan and Brescia in the years from 1570 – 1580 – is finely decorated with floral motifs and figures of harpies along the edges, and the clothes of the young duke and his page are faithful to the fashions of the day. Both historically and and stylistically, it is comparable to Gatti’s Portrait of Ranuccio I Farnese in the Palazzo Comunale, Parma. The Ranuccio portrait has ‘blood ties’ with the sitter of the portrait presented here. Giuliano was the grandson of Pier Luigi Farnese (1503 – 1574), who was also Ranuccio Farnese’s great-grandfather. Even if the painting in Parma is not a portrait of Ranuccio as some scholars suggest, a document in the Archivio di Stato di Parma confirms that Gatti painted a portrait of Ranuccio – Giuliano’s cousin of the same age – the same year that he painted Giuliano’s. However, we have yet to understand how Giuliano – who spent most of his life in Rome or on the Lazio fiefs owned by his father’s family – decided to have Gatti paint his portrait in Parma. It is plausible that the fatherless boy entrusted to his maternal grandfather was sent to Parma in Emilia – the Farnese family’s main fief – specifically to have Gervasio Gatti paint his portrait. Cf. Notizie istoriche dè pittori, scultori ed architetti cremonesi, 2 vols., Cremona 1774, I, p. 243. We are grateful to Dr. Josè A. Godoy for this information.